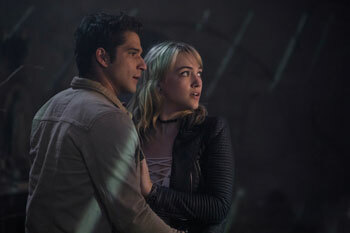 Synopsis: Lucy Hale (Pretty Little Liars) and Tyler Posey (Teen Wolf) star as college seniors Olivia and Lucas in Blumhouse's Truth or Dare, the terrifying new supernatural thriller from Blumhouse Productions (Happy Death Day, Get Out, Split). When a tightly knit group of friends embark upon their last undergraduate getaway and engage in a harmless game of 'Truth or Dare," the game follows them home, forcing them to play or face the deadly consequences. You must tell the truth, or you die. You must do the dare, or you die. If you stop playing the game, then you die." In 2016, when writer/director Jeff Wadlow, the mind behind the wildly inventive KickAss 2 and the break-out thriller Cry Wolf, was considering his next project, he met with master horror filmmaker Jason Blum to discuss potential opportunities for collaboration with Blumhouse. Wadlow felt that their track-record of innovative, blockbuster thrillers"from Happy Death Day and Get Out to Split"made the production house an ideal option. It would be a short time later that Truth or Dare would be greenlit as the next movie from a company known for its innovation and risk taking. Jason Blum notes that he has wanted to work with Jeff Wadlow for some time, and Truth or Dare felt like the ideal fit. The producer has followed his career since Cry Wolf, and Jason Blum appreciated that his director so deftly handles the intricacies of horror…and just how detailed Jeff Wadlow is with story mapping. 'I love projects where we have real parameters," Jason Blum states. 'Usually it is budgets, but even a title can be a real challenge. Jeff Wadlow had this terrific idea based on a concept we'd been playing with, and he worked on the script. He is a writer/director with a great deal of experience, and he was very comfortable with our budget, as well as the amount of days he'd have and the scope we laid out. He wasn't surprised by any of it, and that allowed him to excel. As a result, we're doing more projects together"both on our television and the movie side." The newest member of the Blumhouse team walks us through the genesis of Truth or Dare. 'I had a general meeting with Jason, and we really hit it off," Jeff Wadlow says. 'We were discussing different ideas, and he asked me to come back in a few months later. He and [executive producer] Couper Samuelson wondered if I'd be interested in writing and directing a movie called Truth or Dare." Working from only a general concept, the producers believed that Jeff Wadlow would bring a fascinating take on the idea, as well as deliver a genre-bending film that is signature to Blumhouse. Discussing his inspiration, Jeff Wadlow says: 'I wanted to make a fun, smart, scary movie with real stakes. Cry Wolf was my first bite at the horror-genre apple, and when Jason Blum and Couper came to me with this germ of an idea, I thought this was a great opportunity to create a film that audiences could buy into." Jeff Wadlow liked the idea of crafting a narrative that explores the lengths to which close friends will go to stay alive…one that also asks the audience: 'How far would you go to survive this game?" The filmmaker admits that he's long seen humor in horror. 'We knew it would be crucial to walk the line and make the stakes feel very real among these friends, but also give the audience permission to laugh at the right moments. I've always tried to find levity in the dark parts of my own life, and it was important to walk this tightrope between raw emotion and real laughs." Working from a story by fellow screenwriter Michael Reisz, Jeff Wadlow and his close collaborators"Chris Roach and Jillian Jacobs"put pen to paper to explore a thriller that was as inspired by It Follows and The Ring as it was by Donna Tartt's The Secret History. 'We built something that we hope is as dangerous as it is fun," notes the director. 'We knew this game that the characters were playing should be smart, tailoring its evil, and it should use cracks that exist in their relationships to get at them." The more that Jeff Wadlow and his fellow writers developed the narrative, the more they learned that there are versions of the game of 'Truth or Dare," that exist in almost every culture. The rules give people the go-ahead to do what they wouldn't normally do"like kiss a crush or reveal something deeply personal. 'Rarely are we given permission to do something that we shouldn't," Jeff Wadlow says. 'We took that aspect of the game, and then we added life-or-death stakes. We say that not only do you get to do and say these things you wouldn't normally be allowed to, but if you don't…you're going to die. That formed a sort of perfect storm, providing opportunities for a lot of wish fulfillment…as well as a lot of terrifying moments." As they worked on the screenplay, the writers knew they had to solve two issues. They had to give the game real, life-or-death, stakes and they had to have winners and losers. The story had to force characters to reveal their darkest secrets…and push them as far as possible while trying to stay alive. Jeff Wadlow and his team decided that through a series of exploitations" a deadly, heightened version of what the game teaches us about ourselves"an ancient trickster demon called Callux must move in for the kill. Sums Jason Blum: 'The game uses the personal history of these kids against them." They imagined a group of college friends who head to Mexico for one last getaway before they begin their post-grad lives and head their separate ways. As with any core crew, long-brewing romances and allegedly buried conflicts begin to emerge as they prepare to say goodbye. When a handsome stranger cons our heroine into getting her friends to play a supposedly silly game of 'Truth or Dare," they awaken a trickster demon that is hell-bent on getting them to share their darkest secrets or confront their deepest fear…and if they don't, they'll pay the ultimate price. 'If you want to live," says the director, 'you have to either answer as honestly as possible or do the one thing you don't want to do." Ultimately, Callux forces the group to decide how far they are willing to go to protect their friends. 'Olivia and Markie's relationship is the central one in the film, which is why it has to be tested," shares Jeff Wadlow. 'Both of them are in love with Lucas, and he's the third point of that triangle. They have to learn what it is like to sacrifice everything for the ones you love, if they want to make it out alive." One of the more entertaining aspects of building the narrative was planting seeds for the audience, allowing the story to move progressively into more terrifying territory. Ultimately, every truth-or-dare sequence was designed to highlight a flaw, weakness or secret a character had been harboring. This ensured that it all felt organic to the character. Jeff Wadlow explains: 'We show you that this one character has a drinking problem and that one has a crush on her best friend's boyfriend. As the game evolves, and more probing questions are asked by"as well as more personal dares"it's my hope that the audience starts to lean in, learning more about the players. This allows them to play along and have fun, experiencing the dares, and having a reaction to the questions. They're not only connecting with the characters but also enjoying Callux's malevolence"
Sharing his inaugural experience working within the Blumhouse model, Jeff Wadlow reflects: 'Jason Blum's the best kind of producer, as he is hands on when needed, and understands what it means to be hands off. From our editor's cut to director's cut"all throughout the process"he guided us to make the best version of what we were doing. I appreciate that his attitude is that the film was ours to sink or swim, and there were definitely challenges working with a budget that was a fraction of my last film. But, ultimately, it meant our team had to be more creative when figuring out how to tell this story. Jason has an incredibly group of people working on his projects, and I'm so thrilled I got a chance to work with so many of them. Jeff Wadlow was most impressed that the casting team at Blumhouse, led by Terri Taylor, went all out searching for the perfect talent to embody the complex characters. The casting department spent months finding the perfect actors who deeply understood these roles and deeply wanted to be a part of the production. Blum was impressed by just how quickly Jeff Wadlow was able to pull everything together with the diverse group of performers. 'We were able to attract such a terrific cast, and that's a tribute to Jeff Wadlow's involvement and the very strong script," offers the producer. 'Our movies also have a short production schedule and they're shot in L.A; so that was also a big help." To a person, Jeff Wadlow was moved by the commitment of his performers. 'The cast did an amazing job of bringing the characters to life, as well as introducing personality traits that made you care about them even more," offers the director. 'They allow the audience to fall in love with the characters in these dangerous situations, and that increases the tension three-fold." As the production team began the process of casting, they looked to talent from both the big and small screen. 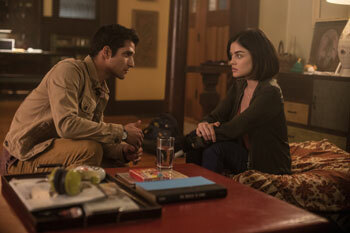 To portray Olivia and Lucas, they recruited Pretty Little Liars' Lucy Hale and Teen Wolf's Tyler Posey. 'We were so lucky to get Lucy Hale and Tyler Posey," states Jeff Wadlow. 'They are lovely people, and after having gone through this grueling process together, I consider them great friends. They're artists, and their ability to convey emotion is so authentic, so finely tuned. They have been working since they were kids and brought all of that experience and talent to our film; they delivered intense, thoughtful, funny, performances." Auditioning isn't just for the cast, it's also for the actors to see if they want to work with the director. 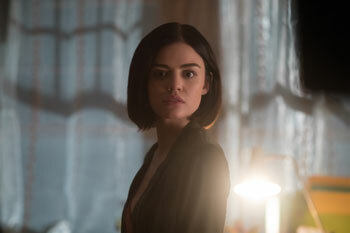 'During her audition, Lucy blew us out of the room," lauds Jeff Wadlow. 'She's insanely talented, and we knew we had our female lead as soon as she finished the scene. Tyler was cast last, as that character was one of the hardest to figure out. Lucas has to have an edge and be strong and tough, but he also has to have this sense of openness and vulnerability at the same time. No one embodies that more than Tyler Posey." The heart of her tight-knit group of friends, Olivia cares more about helping the world at large than she does about taking care of herself. She wants to spend her spring break building houses for the less fortunate, but her best friend, Markie, who she's known since she was little, convinces her to go on vacation to Rosarito Beach in Mexico. When Olivia and her friends get back"and terrifying moments can no longer be brushed off as coincidences"she has no choice but to accept that the game is real, and that it's followed them home. Now it's up to her to convince her friends that this is happening; if she doesn't, people are going to lose their lives. What interested the actress was the deep bond between the young women who are the core of the story. Hale reveals: 'Whenever I read a script, I come up with a backstory for my character. I imagined that Olivia and Markie grew up on the same street. Their parents were friends, and they took dance classes together. They've been through all of the stepping stones with each other. They fight like sisters, but at the end of the day they're blood and will always have each other's back." Hale appreciated that Jeff Wadlow allowed the game to get more and more twisted. One of her more memorable moments of production was when the characters try and trick the trickster demon who's forcing them to play. 'Everyone thinks, -all we have to do is tell the truth and we'll be fine!' But they find out that if two people choose truth, the next one has to do a dare. It gets very dark. Earlier in the story, Markie tells Olivia, -I'll break your hand if you touch me again!' When Olivia is forced to take a dare, she has to do it, or Markie will die. It just escalates from there." Lucas is not simply Markie's boyfriend, but he shares an unspoken crush with Olivia. They've known each other since they were freshmen, and have made peace with the idea that they're just going to be friends. A good guy with a strong heart, Lucas can be tough when he needs to be. That makes for quite the compelling character, because he's about to be in a situation where he's got to make some life-or-death choices. The first person to believe that Olivia is telling the truth is Lucas, because he gets his turn after her. When you get a turn, you realize that this is not a hoax. This is not a joke. This is happening for real. 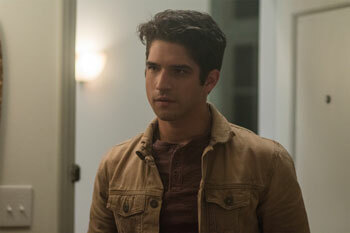 Tyler Posey reflects that Lucas is just as unbelieving as the rest of his group that the events are going down…until the game burns the question into his forearm. 'Even though Lucas doesn't know how to handle everything that's coming at them, he's good at calculating and being methodical. If Olivia's the brains of the group and the leader, he's the idea guy. He's trying to maintain peace in the group as they learn to deal with what's happening." The actor particularly loved Lucas' trip back to Rosarito"alongside Markie and Olivia" to find the root of evil and stop the game once and for all. 'Our characters return to Mexico to talk to this woman and survived a massacre, and try and figure out a way to break the curse," explains Posey. 'While we're at it, we're trying to convince the same creep that brought us out to play -Truth or Dare' to begin with to cut his own tongue out!" Although Markie appears from the outside as if she's got her life together…inside she's a bit of a hot mess. She's dealt with real tragedy in her life. Not only is she barely holding it together in her relationship, she lost her father after his suicide years ago. Oliva's been her rock, and their bond will become the central relationship that is tested. For Violett Beane, known for her work on The Resident and The Flash, the chance to play such a complex character was a welcome one. The performer notes: 'Markie is a complicated friend who pushes Olivia into going to Mexico. She's dealing with a lot of stuff in her personal life, and she isn't ultimately the best girlfriend to Lucas. But she cares so much about him, and they work through their issues." What fascinated Beane about the story is that it layered long-simmering drama between two best friends with supernatural terror. 'At first, Markie doesn't believe the game is really happening because Olivia exposes a secret of hers. She can't believe that Olivia would do that just because someone dared her to. She wants to believe that it could have been for jealousy reasons. It takes Markie a bit longer to believe, until she's forced to break Olivia's hand." Filling out the rest of the group are Tyson, who is getting ready to go to medical school. As much as he feels that he's God's gift to the world, Tyson's friends give him a pass because of his witty ways. The production selected Nolan Gerard Funk, known for his breakthrough role in Riddick and recent turn on TV's Counterpart, to play the morally questionable charmer. Tyson is dating Penelope, who also lives with Olivia and Markie. Played by Grey's Anatomy's Sophia Taylor Ali, Penelope is the life of the party"sweet, fun, beautiful, and down for anything. Still, the fact that she parties a bit too much might just be her downfall. Last, but not least, is Brad, who is the heart of the group. Struggling to come to terms with his sexuality, he hasn't come out to his parents yet. His dad is a no-nonsense police officer, which has created a lot of tension in Brad's life. Ultimately, it's an issue he's going to have to work out throughout the course of the story. Brad is portrayed by Hayden Szeto, whose breakout role was in The Edge of Seventeen, and his performance impressed his fellow performers. States Hale: 'Brad has kept this secret from his dad for a very long time, and his biggest fear is being truthful with his dad. That's why this movie's so interesting: we have all these secrets that are weighing on us. Once we tell them, it can help in a way…even though it's such a twisted dark game." Landon Liboiron, of the Netflix series Hemlock Grove, was cast to play Carter, who deceptively brings Olivia and her friends into the game. Wadlow explains how the character was supposed to be a new beginning for our heroine. 'For Olivia, this feels like a sign that it is time to move on from Lucas and stop pining for him. She thinks, -I'm going to take a risk.' When the night is winding down and she meets this charismatic, friendly, considerate guy at the bar" and the group is pondering what to on their last night in Mexico"Carter says, -I know someplace we can go…'"
The director reflects that it is hard to describe Carter as either a monster or a victim, because he is a bit of both. He is the reason why the characters find themselves in this mess, but he didn't want to be in this situation either. Ultimately, that is the beginning of Olivia's character arc. 'At the beginning of the game, Brad asks her, -If you could choose to save your friends, but let the entire population of Mexico die"or save the entire population of Mexico, but your friends would have to die"what would you choose? By the end of the movie, she has a very different answer than the one she provides in the beginning.'" Cast set, the performers fulfilled Jeff Wadlow and Jason Blum's objective of providing the audience with fully rounded characters to care about. The director offers his logic: 'If you push someone who is already morally questionable into a compromising situation, you don't care as much about the outcome. We wanted to portray multidimensional characters you connect with and like. These aren't placeholders waiting to die, like they often are in horror movies. What makes very human, real moments all the more heartbreaking is that the game is using them against our characters, and there's very little they can do to stop it…other than play." Jeff Wadlow's team finished a draft of the screenplay in fall 2016, continued development with Blumhouse for about six months, and then wrapped casting approximately a year ago. Their prep began in April 2017, then they shot Truth or Dare immediately after. The director describes a particularly interesting exercise to get his story ready for filming: 'After we had written the script, we listed all of the truths and all of the dares and gave them values on a 10-point scale. Then we listed them in order that they occur in the film, and we made sure the values went up as the movie progressed. That attention to detail allowed us to have a film where you feel the tension, constantly rising." Alongside a key crew that included collaborators such as director of photography Jacques Jouffret, Jeff Wadlow's A-camera operator on his second film"and Michael Mann and Peter Berg's go-to operator; co-producer and first assistant director James Moran; production designer Melanie Paizis-Jones, who served in that capacity on Whiplash, The Purge and Insidious: The Last Key; and costumer Lisa Norcia, of The Purge and Whiplash fame; Jeff Wadlow's team was ready for a well-planned shoot. They were joined by stunt coordinator Steve Ritzi"in his third film with Jeff Wadlow. Along with Alan D'antoni (stunt rigger on Baby Driver), Ritzi handled Truth or Dare's extensive stuntwork sequences. 'It was important to both Jason and me that we only collaborate with key creative crew that we'd worked with before, so they would understand the parameters and the kind of movie we were trying to make," Jeff Wadlow notes. 'Since we were on a 23-day shooting schedule in Los Angeles"with only one day in preproduction to take the cast to Mexico so they could bond a bit"we knew it would be a very tight shoot. My editor joked that we shot 40 days in 23." The movie begins when the characters are nearing the end of four years together in college. To help the actors bond before the movie began, so you really believed in their friendships and their shared history, Jeff Wadlow took them on a road trip to Mexico for a 24-hour pseudo-spring break. 'When we piled in a van and went to Mexico together, I gave them all iPhones to shoot footage of each other. It's really personal, and we decided to fold that footage into the film." For the director, one of the scenes that was most intense to shoot was the dare in which Penelope must walk the roof while drinking a handle of vodka. 'We take a character who has a drinking problem, and the game makes her finish an entire bottle, while walking the perimeter of their roof, which is 30 feet off the ground. It was visually interesting to shoot that, and difficult from a technical standpoint, given how small our budget was and how short our schedule was." Jeff Wadlow laughs, 'I can't believe we spent five nights up there!" Jason Blum agrees with his director, noting he appreciated the skill and technique it took from all involved: 'My favorite scene is when Penelope is walking on the edge of the roof. Not because walking on the edge of a roof is that original, but it is the way that Jeff and Jacque shot it. The way they filmed it makes you really, really nervous." He wasn't the only one who was nervous, but under the watchful eyes of D'Antoni and Ritzi, everyone could take an easy breath. Discussing the scene, Ali recalls: 'Filming up on the roof was a lot a fun, but it was terrifying. I feel like if I would have filmed something like that on a green screen I'd have had to simulate a lot of the fear. Being up there"as fun as it was and as comfortable and safe as I felt"I still remember thinking, -I'm on a ROOF right now!' and I drew from my own fear of falling." To capture the moments when Callux possesses his latest victim"asking the infamous question of 'Truth or Dare" and showing his devious smile, the filmmakers turned to a familiar face. The director walks us through the backstory: 'Early on, I started to conceptualize what that would look like. I wanted to avoid tropes we've seen before"the milky eyes and ashen face. I thought about the spirit of the game and the mischief involved and decided that the possessed-look should convey that mischief." Production wrapped, Jeff Wadlow reflects what he'd like for audiences to take away from Truth or Dare. He concludes: 'I hope people have a great time watching our film…that they're scared, laugh and are intrigued. We want them to be emotionally invested in the characters, and when the movie is over, feel like they just witnessed the ultimate game of -Truth or Dare.'" For Jason Blum, his latest thriller is the perfect example of what works with his production company's micro-budget model. He ends: 'When you have a great story, great actors and a great director, the scares are a lot less important. What makes a movie scary is what comes in between the scares, not necessarily the scares themselves. What Jeff Wadlow did, like the other great directors we've worked with, is ensure that the storytelling that comes in between the scares is A-plus, and that makes the scares really land."